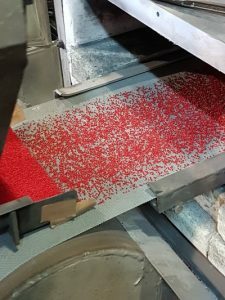 One of my big beading bucket list items has been to see seed beads being made. Recently I was fortunate to tick this off the list. I previously have seen beads being made in The Czech Republic, which was amazing. These were bigger beads that were pressed out of hot glass. Seed beads are made differently, they are extruded from hot glass. Both processes are truly amazing. Japan is the home of my favourite seed beads. 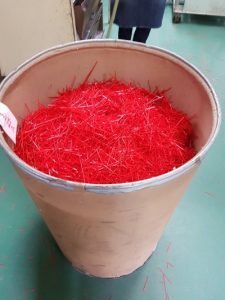 I recently took a holiday to Japan and had the opportunity to visit the Toho bead factory. The country is amazing, we really enjoyed the holiday, experiencing so many new and different things. 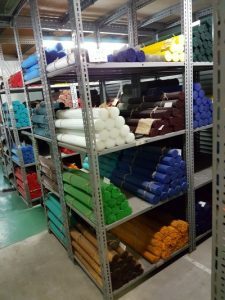 Half a day was reserved for a tour of the Toho factory in Hiroshima prefecture. The Toho factory is a series of buildings, each housing a different process. We were escorted throughout the tour by two staff members , with an explanation of all the manufacturing processes. The first building is where the whole process starts. 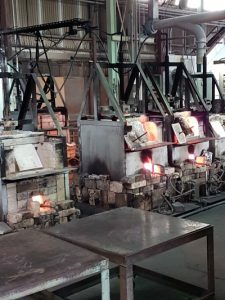 The raw materials for glass are mixed and heated in big kilns. They were keen to show me the bags of silica rich sand that they import from Australia. Great to know that we are contributing to the industry as a country. 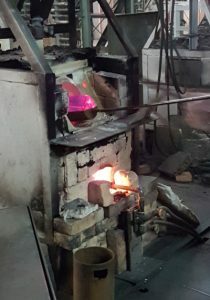 The kilns work 24×7 continually melting glass. 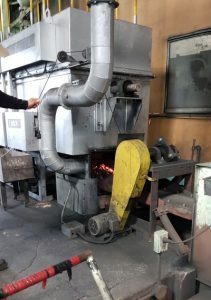 The kilns take approx 25kg of materials at a time. 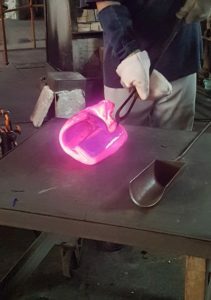 A 5kg scoop of hot glass is pulled from the kiln and worked on a table. It’s rolled in to a rough log shape ready to fit in to the crucible and the second kiln for extrusion. We walked down a set of stairs to see what was happening below as the glass came though the collar. A vertical tube of glass was being formed as it was coming through the collar, with air being forced in the centre to create the hole. The glass looked like rope as it was passed around guides and on to a conveyor belt that gradually leveled out until it became horizontal. Glass is a truly amazing material to see in it’s fluid form. We were reminded not to touch anything, as the glass was still very hot even though it was no longer glowing. 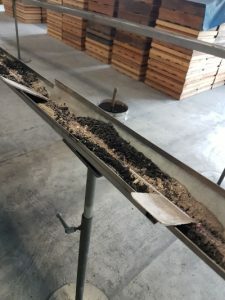 A layer of charcoal in the conveyor belt supported the continuous length rod of glass to help it cool. 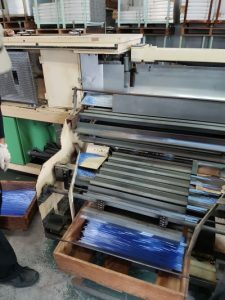 At the other end of the conveyor belt a machine cut the rod in to standard lengths. This machine also checked the precise measurements of the rods, both internal and external diameters. The operator kept watch over this and occasionally checked it manually too in a good old fashioned way, by putting a rod in to a hole and also putting it over what looked like a nail. Holes and nails for all different sizes of beads. Today they were making size 8 beads. 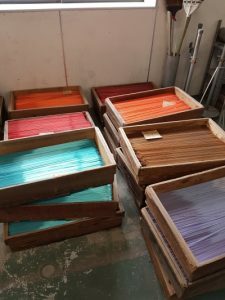 These base colour rods were placed into trays and stacked up for processing. 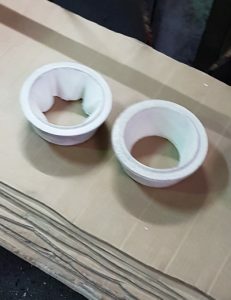 Only one colour and size was placed in each tray. 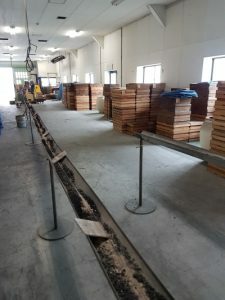 The rods of glass are tied in bundles and moved by trolley to the next building for storage. 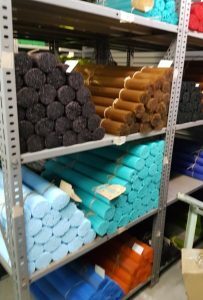 Oh, so many bundles of rods, just a lovely sight to see all the colours – a rainbow of glass. These base colour rods will go on to be cut, and various finishes applied. The room was kept very clean with any spillage being collected in buckets for recycling. The next building was top secret, the cutting room. We were allowed to go in the cutting room, but no photos were allowed. I think most if not all the staff in this room were women. Perhaps that was because it needs very detailed work with your hands. 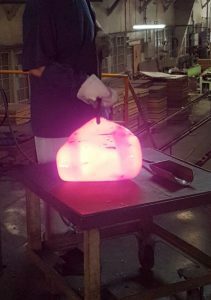 Rods of glass were fed in to the cutting machines and cut to the correct length to form a bead shape. 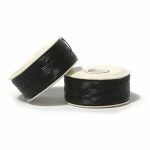 As you know Toho beads are renowned for their precise sizing. 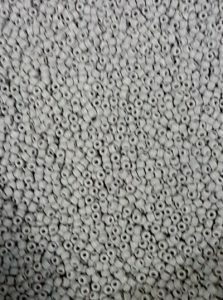 The first step of the manufacturing process sets the outside and inside diameter of the beads. This cutting step set the beads height. Now the cut glass was beginning to look like beads, but they were still quite rough. The next step involved the rough beads to be put through a heating process with charcoal. This would make the edges smoother by melting the glass just a little. The beads end up a very unappealing grey after this process, covered in charcoal. They are then washed off to reveal their original colour. Once the bead has it’s rough corners smoothed, another sizing check is completed. 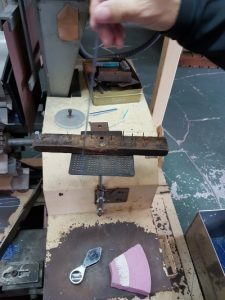 A machine agitates the beads over metal plates with holes in them. 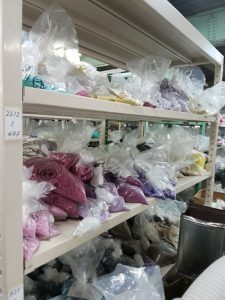 First the beads that are too small fall through the small gaps, then the beads that are the desired size fall through the next section in to a collecting bin. 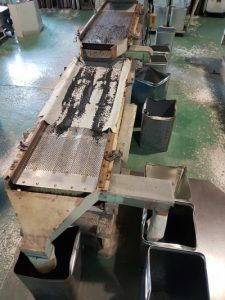 Any oversize beads make it right to the end of the sorting machine and fall off in to another bucket. We watched this for a few minutes and only saw two beads make it to the end. There wasn’t much in that end bin, which is a testament to the precision of the manufacturing process. At this point all the beads that don’t need a coating are finished. 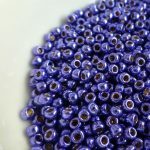 These are the opaque and transparent beads of various base colours. The beads that are to be coated move to the next building. Again no pictures were allowed here as the colour mixes and processes are unique to Toho and a closely guarded secret. The first thing you noticed on entering the building was the strong smell of chemicals. Unfortunately these are needed to make all the lovely colours. 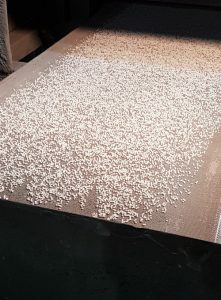 Simple coatings such as lusters are applied and baked on to the beads. 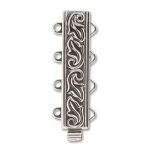 Any bead with a silver or colour lining is first immersed in the colour, and then the outside colour removed after it has dried, leaving the colour only in the inside lining of the bead. Beads are finally stored in buckets and/or bags before heading to the packing room. We saw orders being prepared for export as well as the domestic Japanese market. 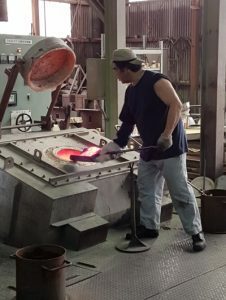 Toho have a visitor centre, bead gallery and glass museum nearby which is open to the public. We saw many intricate bead masterpieces in the gallery and toured the museum. Some of the pieces in the glass museum were over 2,000 years old! It was absolutely fascinating to see the beads being made. 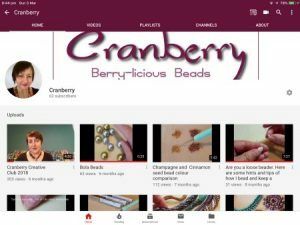 There is so much work and precision that goes in to making beads. 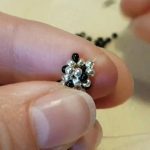 I have now seen seed beads being made – it is everything I expected and more. Thanks to the lovely staff at Toho beads for a great factory tour. Thanks Jo for such a detailed description. It must have been absolutely fascinating – lucky you! I too went on a tour of Japan and had planned making the pilgrimage but the day I could go they were shut!,,,grrrr. So I am very glad to see it through your eyes and live vicariously! Typically the public can’t visit the factory. You need an invitation. However next to the factory is the Toho glass village and museum. It’s in a small village to the North of Hiroshima city. We had to get a train and bus to get there. Loved the blog. It’s something I’d love to do – see how those tiny pieces of glass are formed. The pictures and descriptions were wonderful! Waaaw bedankt om dit te delen hoor, wat interessant om dat eens te zien zo weten we waar onze ” kleine hebbedingetjes” gemaakt worden en hoeveel werk eraan vooraf gaat. and translated (by google) Waaaw thank you for sharing this, interesting to see that, so we know where our “little gadgets” are made and how much work precedes them. What a treat – the photos, and your commentary. Thank you! Thank you for the newsletter, much appreciated, Will look forward to further issues.